Charlene Leary’s mixed media pieces layer thread, dye, paint and metal into patterns and forms that reflect the natural world. Charlene found her expressive voice in fiber when she was introduced to weaving as part of her occupational therapy training in 1970. Shortly after moving to NY in 1973 to practice O.T., Leary continued her creative goals in weaving and other fiber media. During her 30 years in the fiber arts she has studied with notable instructors including Lia Cook, Catherine Ellis, Joan Morris and Polly Sterling. 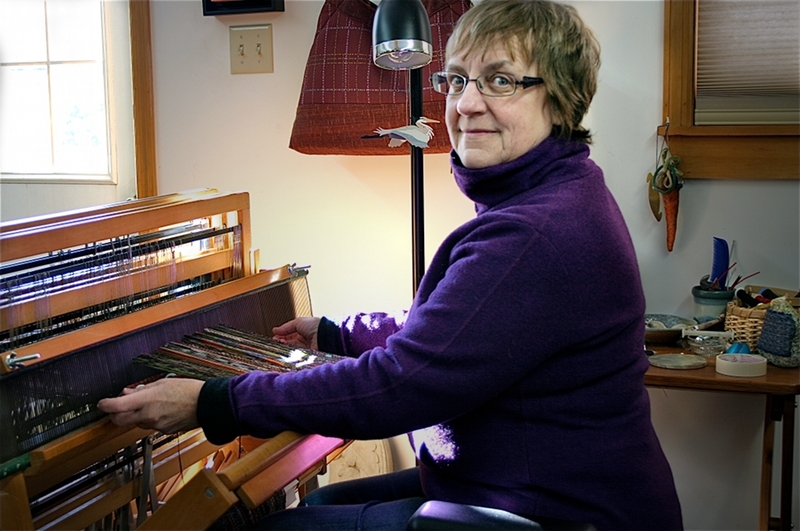 Charlene has taught weaving and surface design and has exhibited her artwork throughout Northern New York and New England. She has appeared on TV8, participated in the Arts in Education Program, and presented at the Hyde and Chapman Museums in Glens Falls, NY. Charlene is a member of the Hudson-Mohawk Weavers’ Guild and has been published in Handwoven Magazine. Using fiber to capture the energy of the Adirondack Mountains around her studio, Leary hopes that her work strikes a visual dialogue with others in her desire to interpret the diversity of nature.